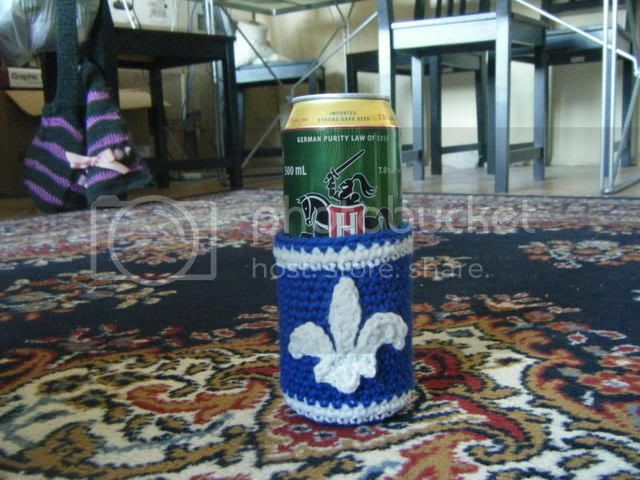 Because my man person was pining for la belle province, I made him a quebecois beer cozy. He said it was perfect. So for all you canadiens out there, here's the ostie de bon cozy! With blue yarn, make an adjustable loop. Rnd 26: Sc in each st around, cut blue yarn. With white yarn, ch 6, sc in 2nd ch from hook. 1st petal: Ch 7, sl st in 2nd ch from hook. Sc & hdc inc. Dc inc. 2 dc inc. Hdc & sc inc. Sl st inc. Sc inc of original chain. 2nd petal: Ch 9, sl st in 2nd ch from hook, sc inc, hdc inc, dc inc, tc inc, dc inc, sc inc, sl st inc. Sc inc of original chain. 3rd petal: Same as first petal, but twist right before the sc inc of original chain. Sc inc.
Bottom: Ch1, sl st in2c of the bottom of the chain, [sc, ch, dc, ch, sc] inc, sl st in2c. Cut yarn. Sew the fleur-de-lis applique to the cozy body, making sure that it's between the two white lines. Sew in ends. LOL it's been a while since I've heard quebecois swearing. Thanks for the laugh :) Great pattern!